Unique design for drinking fountain in public place. All the structures and panels are made by stainless steel, which are durable and never rusty. Filters are optional (Filters can be built inside.). CJ-311-1 is with compressor and cooling system which can offer cold water (cold tank capacity: 2.2L). The standard bubblers are top-press bubblers. But you can choose to change 1 bubbler to front-press bubbler (The push button of the bubbler is on the front.). 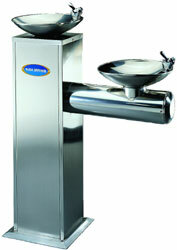 You can choose to use top type or front type push button for bubbler. You can choose to put T33 filter inside.